Blake has been getting more into crafts recently than he use to. When we returned from our break away to Camber Sands I was glad to receive 2 Mini Mosaic Craft Time kits from Brainstorm. The mini mosaics are kits with over 200 sparkly adhesive foam tiles which children stick on to decorate. There are 6 different designs to choose from unicorn, kitten, dragon, angel fish and dolphin. They are designed for children aged 3 and above, however at 2 and half Blake loved them too. They are an ideal craft activity for children to do on a rainy day or when travelling as they are mess free, simple to do and a great pass time especially with the summer holidays now here. As I said above the kit comes with over 200 sparkly foam tiles and a picture to stick them on. They are easy to peel, stick and create. The image is colour coded so that your child is able to see where to stick each foam tile. They may need help with this if like Blake and your child doesn't know there colours well yet. We were sent the kitten and unicorn to have fun with and Blake. Blake and I worked together to do the picture and he loved sticking the foam tiles to the picture. 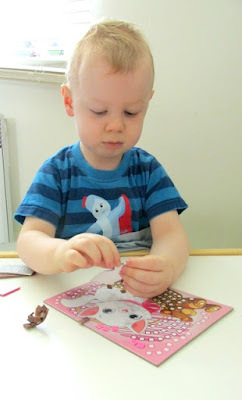 There is even some left over tiles which we will be using for Blake to do his own crafty picture with. As the tiles are quite small I can see why the activity is suitable for ages 3 years and over. 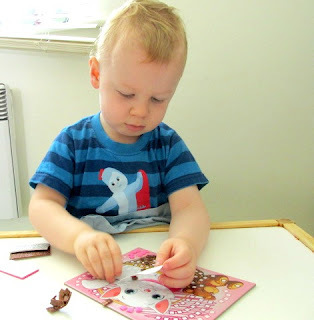 The activity due to the small pieces means that it helps children to develop their hand eye coordination and fine motor skills. Blake was very happy with our creation and so we are going to add it to his memory box. We can't wait to start on the unicorn one now. If you fancy giving the mini mosaics a try than you can purchase them on Amazon RRP:£19.99 for 6 pictures. What great crafting, this would make an ideal gift for any young child.